The Chief of Staff to the Osun State Governor, Alhaji Gboyega Oyetola, has won the All Progressives Congress governorship ticket. Senator Ovie Omo-Agege, who acted as the Chairman of the APC Governorship Primary Election Panel, announced the result of the election on Friday night. 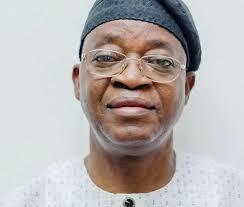 Oyetola, who is from Iragbiji, Boripe Local Government Area, in the Osun Central Senatorial District won the highest number of votes in the primary . He polled 127,017 votes to defeat the Deputy Speaker of the House of Representatives, Mr. Lasun Yusuf; the Speaker of the Osun State House of Assembly, Dr. Najeem Salam; Mr. Kunle Adegoke; Mr. Saka Layonu (SAN), and other contestants. Some of the governorship aspirants had announced their withdrawal from the race shortly before the exercise started. One of the aspirants, who participated in the primary, Mr. Kunle Adegoke, described the exercise as a charade, saying it was skewed to favour the winner. He lamented that the party conducted the primary without a verifiable membership data base despite using the direct primary method instead of a delegate system. He also alleged that hoodlums were used to harass and coerce members of the party to vote for Oyetola and that those that resisted were beaten by the thugs. The Senator representing the Osun East Senatorial District, Babajide Omoworare; Secretary to the Osun State Government, Alhaji Moshood Adeoti; and the Chairman of the Osun State Local Government Service Commission, Mr. Peter Babalola, had withdrawn from the election before its commencement. Adeoti announced his withdrawal from the primary in a statement made available to our correspondent by the Director of Media and Publicity, Moshood Adeoti Campaign Organisation, Mr. Kayode Agbaje. Omoworare’s decision not to participate in the exercise was contained in a statement by his Director of Communications, Mr. Tunde Dairo, while Babalola’s decision to boycott the election was monitored on Rave FM, an Osogbo-based private radio station.